The Home Buyer Tax Credit contained in the American Recovery and Reinvestment Act of 2009 has been given much credit for buoying the housing market. But simple arithmetic shows that the credit’s effect has been minimal. The law passed in February 2009 included a temporary 10 percent capped tax credit for qualified first-time home buyers. Later the program was expanded to include repeat home buyers, and recently home buyers were given until September 2010 to complete their qualified transaction. Last week the Federal Housing Finance Agency released its housing price index for May 2010, and yesterday the Standard & Poor’s/Case-Shiller index was released. Both show that housing prices have not fallen significantly, if at all, from what they were a year before. News articles have asserted that housing prices stopped falling because of the tax credit and have planted seeds of worry that a housing-market collapse could continue when the credit expires. The Internal Revenue Service reports that only $19 billion of tax credits have been claimed so far. The average credit was $6,000 to $7,000, small compared with the average sales price for a home of more than $200,000. More importantly, most home sales transactions involved no tax credit because the buyer was unqualified, or perhaps unaware. If these transactions were at all affected by the credit, it was only because they occurred in a wider market in which some transactions did involve credits. Deflation has returned this summer, but it’s still nothing like what happened in the Great Depression years of 1929-33. During most of our lifetimes, the prices of things we buy have generally increased over time. We can name some exceptions, but otherwise most items (even houses) carry prices that are higher now than they were 10, 20 or 30 years ago. This general increase in consumer prices — often called inflation — has become familiar. Employees expect regular pay raises, and employers can normally afford them because they are increasing the prices of the products they sell. One occasion was 1929. Consumer prices were pretty constant during the 1920s. The chart below picks up the story in January 1929 with the red line. 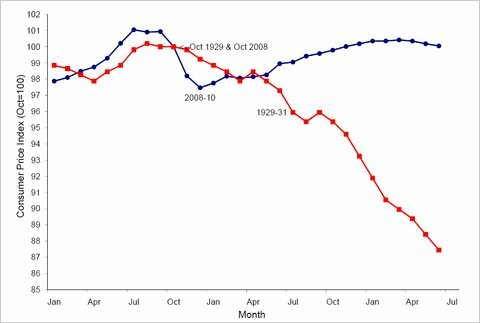 That line measures the seasonally unadjusted consumer price index in each month through July 1930, normalized so that October 1929 is 100 (for example, the value of 97.9 in April 1929 means that prices then were 2.1 percent lower than they would be in October). Prices were heading up in the spring and summer of 1929, during which time lenders might have expected that the typical homeowner would obtain a pay raise and the typical farmer would someday fetch more for his crops — in both cases making it easy for them to pay their respective mortgages. In the fall of 1929, the inflation stopped and prices headed down (incidentally, that’s when the Great Depression began), falling almost every month for nearly four years. By the summer of 1931, when the Depression was about two years old, this deflation had brought prices down almost 13 percent from their 1929 peak. It was difficult for homeowners and farmers to make mortgage payments as their income fell sharply. The blue line in the chart shows the consumer price index for 2008-10. Like the 1929 series, the 2008 series is normalized so that October is 100. The chart shows that consumer prices also rose in the spring and early summer of 2008. Inflation had stopped by the fall, and consumer prices headed down. Unlike the deflation of 1929, the deflation of 2008 lasted only a couple of months, after which time consumer prices increased for more than a year. On Friday, the Bureau of Labor Statistics reported that consumer prices had fallen three months in a row since March 2010. That’s not good news, because our economy could benefit from some inflation. But the silver lining is that the latest deflation is mild, and so far short-lived. Today that was updated by the TARP's Special Inspector General, who increased the subsidy estimate by $500 billion!. The U.S. Treasury reported today that June 2010 federal corporate tax collections were the highest of any month since September 2008. 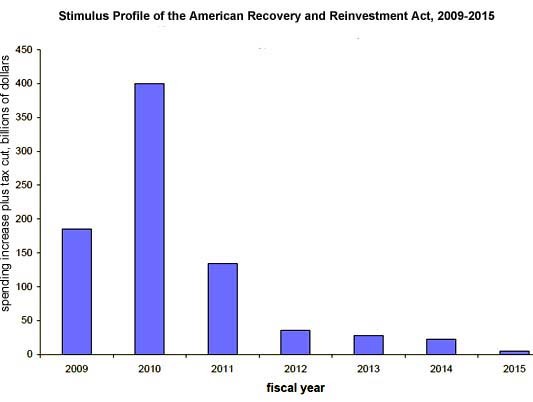 The tax cuts and public spending increases from the American Recovery and Reinvestment Act of 2009 are coming to an end, and economists and politicians disagree as to whether the federal government’s “stimulus” should continue. 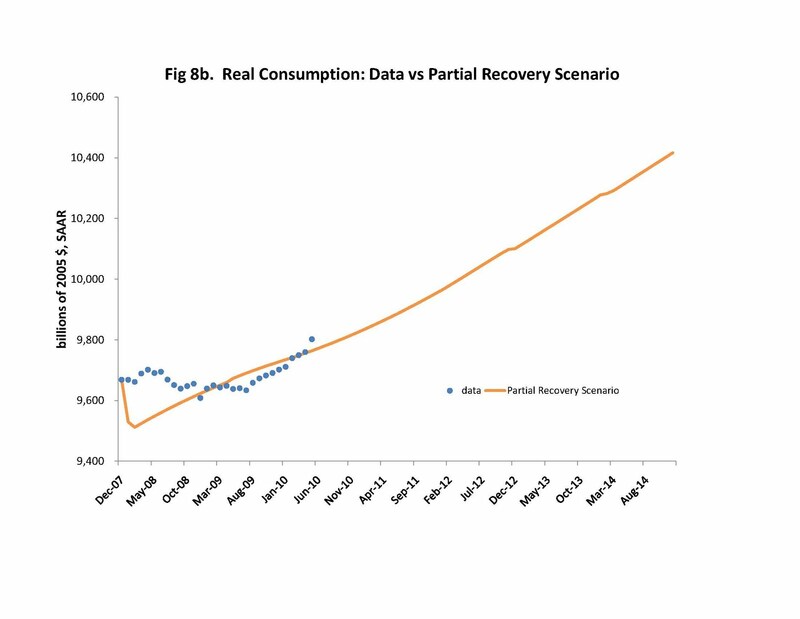 But the conclusion of the act offers a unique opportunity to measure the impact of fiscal stimulus. The Obama administration and its supporters promised that the fiscal stimulus law would create or save more than three million jobs by now. Their stated intention was to have the government spending while the economy was weak, then end the extra spending when the economy was recovering on its own. But instead of adding jobs since the law was passed in February 2009, our economy has reduced employment by more than two million. Some of us think that the fiscal stimulus made a bad situation worse, and that employment would have grown, or fallen less, if the stimulus law had not been passed. The Obama administration contends that, apart from the stimulus law, the economy is worse than anyone expected, and that the law kept the drop in unemployment to two million, rather than more than five million. We probably will never know how much the economy would have grown or shrunk in 2009 and 2010 without the stimulus law and thus cannot disprove the argument that events outside the federal government were destroying jobs faster than the federal government could ramp up its spending. But the 2010 fiscal year is coming to an end in less than three months, so that almost three-quarters of the law’s spending boosts and tax cuts are behind us. In the 2011 fiscal year, the law’s combined tax cuts and extra spending will be $265 billion less than in the current fiscal year. If stimulus advocates are correct that this recession is deeper and longer than they thought, for reasons beyond the federal government’s control, then having the government now tighten its belt by $265 billion will cause employment to fall as much as another million from its currently stimulated levels. 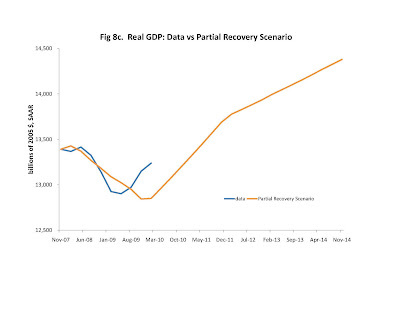 If the stimulus skeptics are correct, then fiscal 2011 will finally be a time when the private economy can grow. We’re only a few employment reports away from resolving this debate. Employment sometimes falls, and in theory the fall could occur because of a change in supply, a change in demand, or both. 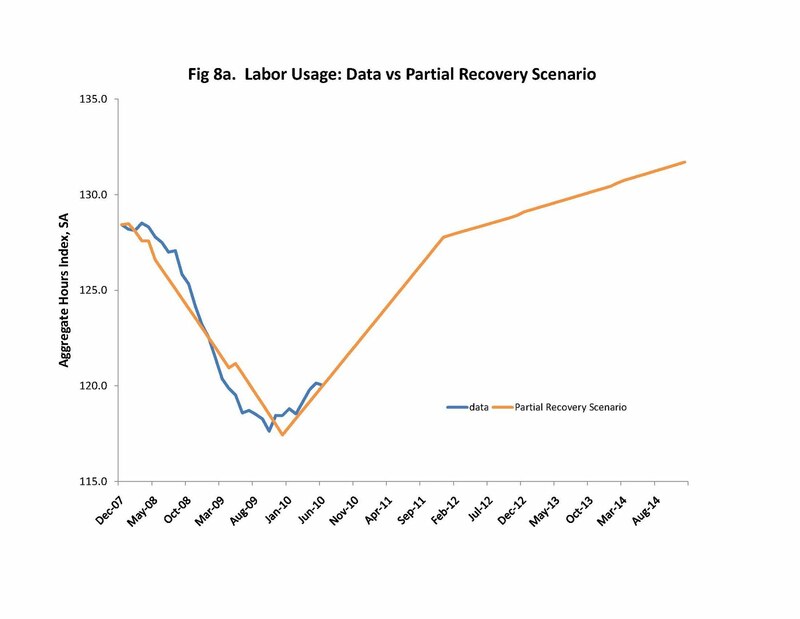 The best way to determine which is more important is to examine labor productivity: productivity is pro-cyclical when the employment cycle is a result of a demand shift, and counter-cyclical when it is a result of a supply shift. Some economists have proposed using quits and layoffs to make this distinction. When labor supply causes the employment reduction, supposedly quits will be high and layoffs low. However, as JOLTS measure quits and layoffs, the two are often POSITIVELY correlated. Thus, there are sometimes supply shocks that increase both quits and layoffs, and there are sometimes demand shocks that increase both quits and layoffs. Consider, for example, the seasonals of layoffs and quits in the JOLTS data, which I measure in the monthly data as the residual from a regression of either layoffs or quits on a smooth polynomial in time. The nationally quit and layoff residuals are POSITIVELY correlated, even if I exclude Oct-Jan which is the seasonal most obviously associated with a demand shift. I found the same pattern for the southern region only, where the changes May-July and July-Sep should be more about supply (more workers are available when school is not in session) than demand (perhaps in the north cold weather in the spring or fall affects demand). I found the same pattern for each of the 25 industries tracked by JOLTS, with only two exceptions: mining and construction. Even in those two industries, layoff spikes seem to be associated with quit spikes, its just that quits are somewhat above average when there are several consecutive months of low layoffs. Professor Krugman and Delong are again trying to perpetuate the myth that a multiplier less than one is inconceivable for today's stimulus and today's economy. In fact, there is a very simple story of how the multiplier would be zero (and, of course, zero is less than one). Namely, in the model, the government buys things that are so useful that citizens would have purchased them on their own. Once the government comes along and buys such things on behalf of its citizens, the private sector stops buying them, and total spending is unchanged both in total amount and in terms of the types of goods purchased. This is not the only model of fiscal policy that economists use, but it is used a lot, so I am surprised that Professors Krugman and Delong overlook it so often (I wrote about this earlier this year, when Professor Krugman also seemed to forget). So it's clear that we have models with multiplier less than one. Moreover, the Obama administration claims that its stimulus really did purchase things that are useful. So the possibility that the multiplier is less than one cannot be dismissed solely on the basis of logic. Here's an article with vivid evidence that many mortgage defaults are not because of unemployment, unless unemployment were (miraculously) to disproportionately hit people who were able to borrow a lot just a few years ago. Labor market statistics for June 2010 were widely received with disappointment. But it is no surprise that some workers whose jobs ended in this recession will never work again. 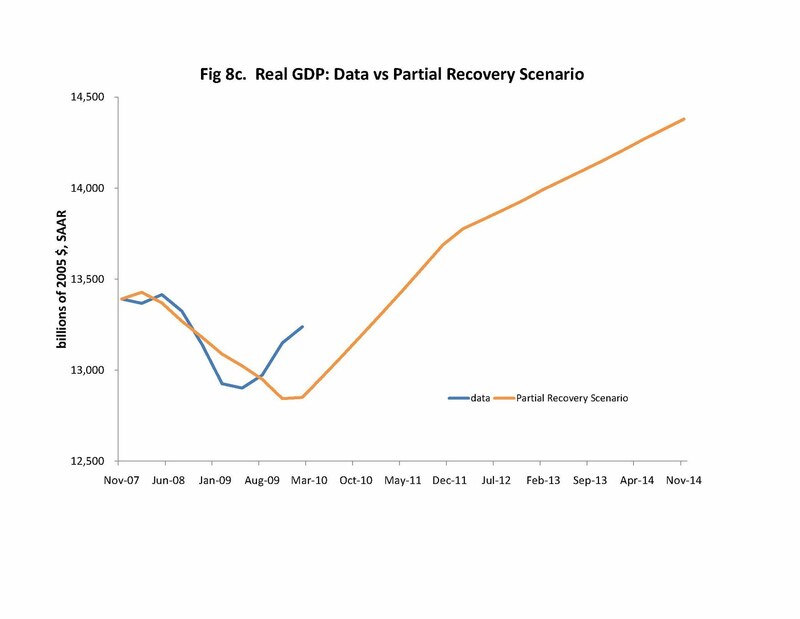 It has always been clear that there would eventually be some kind of recovery from the 2008-9 recession. After all, falling housing prices and underwater mortgages were not going to last forever. Our population continues to grow, and eventually that population will demand more space in which to live. And worker productivity remains strong. Consumers apparently agreed with this assessment, because they reduced their spending from previous trends much less than employers cut jobs. The chart below shows seasonally adjusted indexes of consumer spending (adjusted for inflation and productivity growth before the recession) and hours worked (adjusted for population growth). For example, a value of 96 for consumer spending means that inflation-adjusted consumer spending was 4 percent below its trend before the recession, and a value of 90 for aggregate hours means that hours worked per American were 10 percent below what they were when the recession began. 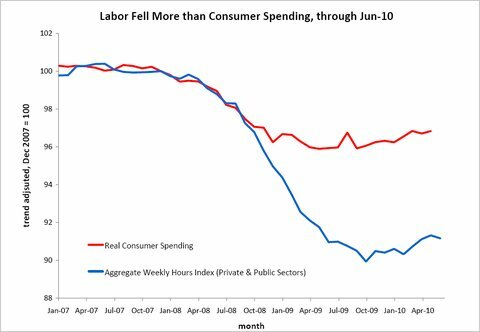 Consumers reduced their spending a lot by historical standards – it’s only once in a generation that consumer spending falls 4 percent below trend as it did by the end of 2008 – but by late 2009 their spending had been cut only half as much as their hours worked had. Either consumers have been expecting that employment will at least partly rebound, or they plan yet further large spending cuts. Thus, one piece of good news over the last nine months is that the latter has not yet transpired: the average consumer has not cut spending further, but rather since September 2009 has increased spending at a rate somewhat faster than before the recession (the trend-adjusted consumer-spending index went to 96.8 from 95.9; the spike in August was related to cash for clunkers). The other news is that hours worked have increased somewhat faster than the population over the past nine months, which is consistent with the view that the labor market would at least partly recover, and not get worse than it was in 2009. On the other hand, no one should have anticipated a rapid and full recovery for hours worked. For example, it will not be too long until large numbers of baby boomers are retired, rather than working as most of them are now. For better or for worse, many in our country want a more extensive safety net and more government regulation of business activities, as Western Europeans already have. Economists may argue about the short-run effects of a generous safety net, and whether it is desirable in the long run, but they agree that one way or another a generous safety net eventually reduces hours worked per person. Even without expanding social programs, it seems that the Bush tax cuts may expire, and the federal government may otherwise raise taxes. With higher tax rates in the future, we have to expect hours worked per American to remain below what it was before the recession. 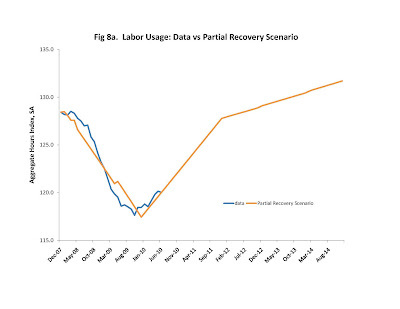 Consumer behavior also seems to agree that the labor market will not fully recover. By my calculations, consumers could have cut their spending half as much as they actually did if they had expected the labor market to get back to prerecession levels by 2012. But in fact we saw the biggest consumer spending cut in a generation. So if you expect all of the people who lost jobs in this recession to someday be working again, there will be many disappointing employment reports ahead. But you can expect the job market to grow at least as fast as our population over the next couple of years. "When the economy is booming, and lack of sufficient willing workers is limiting growth, generous unemployment benefits may keep employment lower than it would have been otherwise. But as you may have noticed, right now the economy isn’t booming — again, there are five unemployed workers for every job opening. Cutting off benefits to the unemployed will make them even more desperate for work — but they can’t take jobs that aren’t there." To the contrary, there is plenty of evidence that supply during this recession mattered as much as ever: here, here, and here. Updates including consumption through May 2010 and labor usage through June 2010. 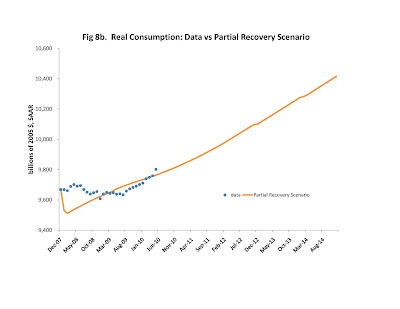 The yellow curve is the forecast I prepared almost a year ago, and have not changed since. This time I changed the consumption display format -- made the "data" circles so that they might not be covered up by the forecast! My model is a simple version of the neoclassical growth model, so there's some luck here that the labor forecasts are within tenths of a percent and the consumption forecasts within hundredths of a percent. The May consumption spike comes from the May spike in Federal employment (I measure consumption of both private and nondefense public sectors, and estimate monthly public consumption from the monthly time pattern of government employment).